What can I reuse or recycle as moulds for making new crayons from old ones? | How can I recycle this? I’ve melted down crayons of vaguely similar color and poured the wax into toilet paper tubes lined with waxed paper, to assure that it wouldn’t soak through. It worked well enough that I’d do it again if I get that many crayons again. It seems to me that any of the silicone baking equipment would also work well. YOU CAN SHOP IN FLEA MARKETS,CHURCH BASEMENT OR YARD SALES FOR THE CANDY MOLDS TO MELT CRAYONS IN. THEY ARE CHEAP & THERE ARE ENDLESS SHAPES TO BE HAD. I like to use plaster of paris and to make different Fun shapes I collected a whole range of “moulds” from Shops. A lot of Items come in all sorts of plastic shapes could they be used for this purpose? I’m looking ahead in your subsequent publish, I will try to get the hang of it! Melt them and use to make different interesting shape. One of my thought is design all members of a family. Actually, those star shaped crayons are wonderful for younger kids, as long as they’re not too large. The body of the star fits neatly in the palm of the hand, and little fingers can wrap around the points of the star more easily than they can grasp a cylindrical crayon. And you don’t have to worry about the points hurting – they get worn down into a more rounded shape pretty quickly with use. 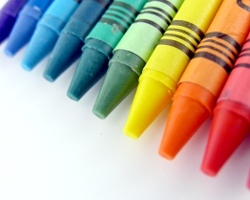 My favorite crayons as a kid were star shaped, with each point being a different color. I’ve seen ice cube trays that are shaped for cylindrical ice cubes (meant to fit into the top of a water bottle). 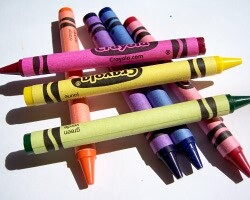 Those would make some nice thick crayons to color with. Perfect for little hands.